I had the pleasure of photographing Hanna and James' wedding at Crundale Church, their home in Stelling Minnis and Deal beach on Friday. The hot, sunny weather returned with a vengeance so I was looking out for shady spots and using high dynamic range photography when I had to shoot in direct sunlight. Where there's a will, there's a way. The wedding ceremony took place at Crundale Church which is set in an idyllic spot in the heart of the North Downs and is absolutely beautiful. We then moved on to a marquee set in the flower meadow behind their home in Stelling Minnis (minnis means ancient common land) for afternoon tea and dancing to swing jazz. I, ably assisted by my good friend Lucy, then met up with them in Deal in the evening for a further hour of photography. We went on to the pier and beach, did a lot of off-camera flash using Pocket Wizards, and made it up as we went along. Being Brits we couldn't resist creating some cool Bond-esque shots! 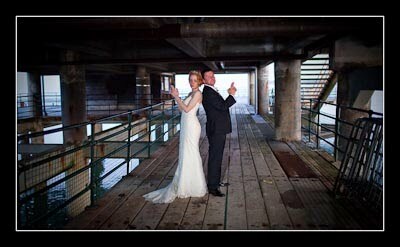 I've finished post-processing their photos - please check out their wedding gallery. David, just wanted to say I'm a newcomer to your blog and it's unbelievably informative for people like myself just starting out. The exposure you achieve is amazing, and your work is so nicel Thanks for sharing. Helen, thank you so much for this lovely feedback - much appreciated.